The olive-sided flycatcher has a large and diverse breeding range. They breed across Canada, Alaska, the western half of the United States and the northeastern United States. Here in Minnesota they breed in the northeast corner of the state but both of these birds were photographed in the south east part of the state. During the winter these birds migrate to parts of Central America and northern South America. 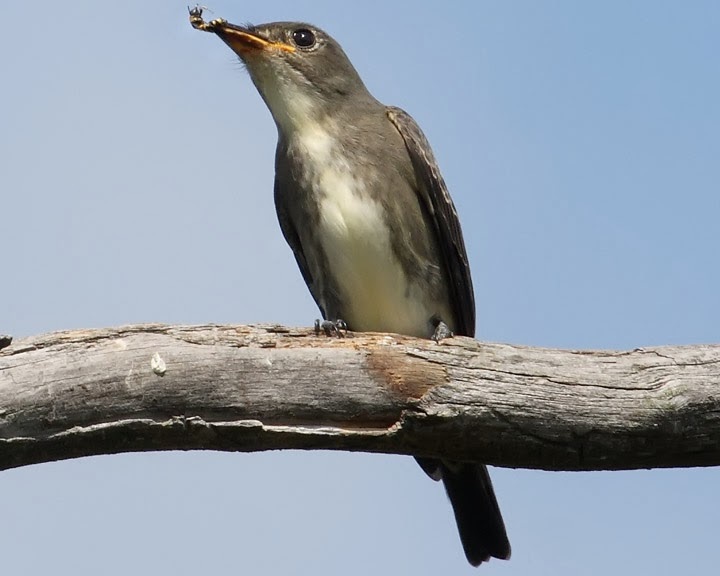 Olive-sided flycatchers eat flying insects which they usually catch in flight. I watched this bird catch about a half dozen bees with in a few minutes. From his perch on the branch he would fly up into the air, looping around, and then return to his perch with a bee in his beak. 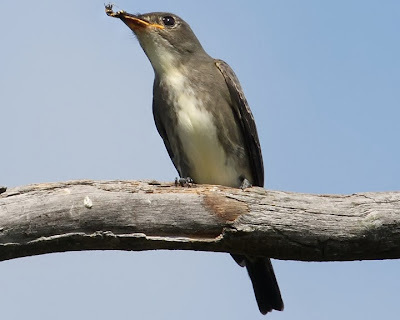 Olive-sided flycatchers live in forested habitats. Burned areas are preferred habitat because there is usually plenty of burnt snags for them to hunt fromand not a lot of brush to get in their way while they hunt. A pretty large flycatcher species by the looks of it, cheers for sharing. What a beauty... great shots. I saw how they catch flies or other insects on TV. Very interesting. Fantastic shot of the flycatcher with his prize. Almost looks like he's smiling! 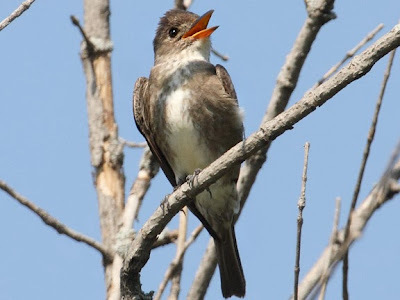 The only flycather I have seen is the great crested flycatcher. They are wonderful to watch and very adept at catching insects. This is my first exposure to the Olive Sided Flycatcher ... a very busy little fellow. Thank you for the information, EB. HI Jeff Great to see these birds catching their prey. Do they beat it to death like Bee eaters do before they eat it? The goal of Ecobirder is to use photographs, facts, and stories to entertain, educate, and inspire people about the natural world around us. All images on this website are the property of Jeff Fischer and cannot be used without express written permission. 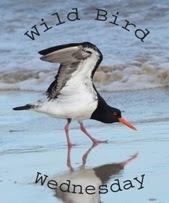 The Biggest Week in American Birding!